Dispossession: The Action of depriving someone on land, property, or other possessions. Few South African elite, seem to understand the concept of dispossession, we talk about who was in South Africa first, as the rightful owners of the land. Conveniently divide the black groups into Koi, Khoisan, and other blacks, attributing the original occupancy to the Koi and Khoisan, and claim that other blacks came from the North. We ignore the fact that the Dutch, arrived as the Dutch East Indies Company, a chartered Dutch Company, and that the Netherlands never officially attached South Africa, the English East Indies Company overpowered the Dutch East Indies Company, and took control of their possessions. What did the Dutch, and what did the English annexe by 1835, and had they in nearly 200 years, achieve fair dispossession of the entire South Africa, and was this dispossession, in the name of every white that would settle in South Africa? The Portuguese, Italians, Germans, French, Swiss, many of these communities, will be heard to support that the Koisan comment on who beat the white to their possession. By 1900, in the ‘colonised Africa’ the old Free State and Transvaal, were ZAR Republics, officially in the hands of the Boer. In the comment below, a quote from the Library of US Congress, by the time the white arrived in the Eastern Frontier, the Nguni densely occupied the Eastern Cape. The Kaalvoet Comment reflects that none of the ‘control’ structures, by the various Country powers, has any relevance to where our black people were fairly dispossessed, our black people were dispossessed through the 1913 Native Land Act, they should have had the same rights as the white foreigners, the Portuguese, Italians, Germans, French, Swiss, and other groups, to purchase and possess land. Land Dispossession took place through until the 1990s, and all whites benefitted from this Land Dispossession, if it were not for this land dispossession, as a result of the 1913 Native Land Act, today Rosebank and Sandton, would have been owned by black people, off the Alexandra residential development, and the Sandton and Rosebank areas, would be Alexandra Extensions 10 to 25. Let us not say it happened 100 years ago, 200 years ago, 300 years ago, and there is nothing that can be done. It happened 30 years ago, and there is something that should be done. 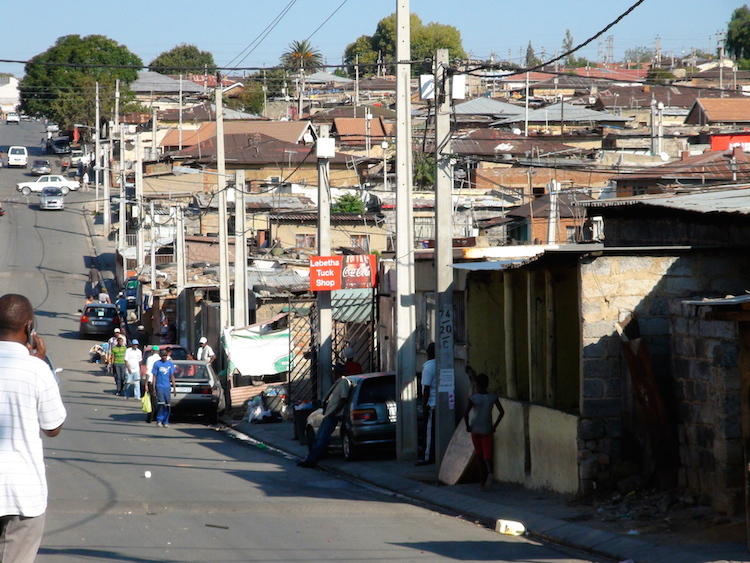 Walk the streets of the Townships, talk to the people, and we will find solutions. The British adopted contradictory policies in ruling their newly acquired Cape Colony in the first three decades of the nineteenth century. Having seized the Cape from the VOC in 1795, the British returned the colony to the Dutch government in 1803 when peace had been concluded with the French. In 1806, however, with the beginning of the Napoleonic Wars, the British again took the Cape in order to protect the sea route to their Asian empire. Like the VOC before them, the British tried to keep the costs low and the settlement small. Local officials continued the policy of relying on imported slave labor rather than encouraging European immigration with the latter’s implication of permanent and expanding settlement. They also introduced racially discriminatory legislation to force Khoikhoi and other so-called “free” blacks to work for as little as possible. The Hottentot Code of 1809 required that all Khoikhoi and other free blacks carry passes stating where they lived and who their employers were. Persons without such passes could be forced into employment by white masters. The British attempted to alleviate the land problems of Boers in the eastern Cape by sending imperial armies against the Xhosa of the Zuurveld (literally, “sour grassland,” the southernmost area of Bantu-speaking settlement, located between the Sundays River and the Great Fish River). They attacked the Xhosa from 1799 to 1803, from 1811 to 1812, and again from 1818 to 1819, when at last, through ruthless warfare, they succeeded in expelling the Africans into the area north of the Great Fish River. Thereafter, the British sought to create a fixed frontier by settling 5,000 British-assisted immigrants on smallholder farms created out of land seized from the Xhosa south of the Great Fish River and by clearing all lands between the Great Fish River and the Keiskama River of all forms of African settlement. But other policies and developments worked against these measures. In 1807 Parliament in London ordered an end to British participation in the slave trade everywhere in the world. This decision threatened the basis of the Cape’s labor supply, for farmers in the eastern areas as well as in the west. British missionaries, who were active in South Africa for the first time in the 1810s and who had a sympathetic audience in Britain, condemned the cruel labor practices often adopted by Trekboers against their slave and Khoikhoi workers and decried the discriminatory provisions of the Hottentot Code. Although British officials did not rescind the legislation, they did respond to this criticism by establishing a circuit court to monitor conditions in the western Cape. This court offended many Boer sensibilities by giving equal weight to the evidence of “servants” and “masters,” black and white alike. The British also raised a force of colonial police, including Khoikhoi regulars, to enforce the court’s authority. In 1815 a Dutch-speaking Afrikaner farmer who refused to answer a court summons for mistreating a Khoikhoi employee was shot dead while resisting arrest. Relatives and neighbors rose in what became known as the Slachter’s Nek Rebellion, but their resistance was soon crushed, and the British hanged five of the rebels. British policies on the eastern frontier also engendered growing Boer hostility. The attempt to close the frontier in 1819-20 following the defeat of the Xhosa and the importation of British immigrants only exacerbated land shortages. British settlers found that they could not make a living from small farms, and they competed with the Dutch pastoralists for the limited arable land available, thereby intensifying Boer-British tensions. The British government, acting largely at the behest of the missionaries and their supporters in Britain in the 1820s, abolished the Hottentot Code. Ordinance 50 of 1828 stated that no Khoikhoi or free black had to carry a pass or could be forced to enter a labor contract. Five years later, the British Parliament decreed that slavery would no longer be permitted in any part of the empire. After a four-year period of “apprenticeship,” all slaves would become free persons, able, because of Ordinance 50, to sell their labor for whatever the market would bear. Moreover, slaveowners were to receive no more than one-third of the value of their slaves in official compensation for the loss of this property. The Boers felt further threatened when, in 1834 and 1835, British forces, attempting to put a final stop to Boer-Xhosa frontier conflict, swept across the Keiskama River into Xhosa territory and annexed all the land up to the Keiskama River for white settlement. In 1836, however, the British government, partly in response to missionary criticism of the invasion, returned the newly annexed lands to the Xhosa and sought a peace treaty with their chiefs. Animal before human lets think human before animal, today the Save the Rhino campaigns, is supported by every person, let us give some of our Save the Rhino empathy, to the blacks, dispossessed on the land, and to other groups today, who are suffering from the crime in our country. “Sirs, as we look at Sol Plaatje’s comments in his submission to the Crown, he comments on the conservation of wild animals, something so close to all our hearts, and as ardent supporter of our National Parks, I ask myself how we could have set aside 2,292,167 morgen for the Kruger National Park, and not care whether the black populations’ livestock starved, and in turn, whether we intended taking the conservation of the black development out of the spectrum of the ‘white world’? TripAdvisor Review Taste of Africa Soweto and other, Cedric & Nettie de la Harpe, consider that our Soweto Tour, or rather visit, is #1, and through this, they have driven Radical Economic Transformation in the tourism sector since 2004. As South Africa’s political buzzword is Radical Economic Transformation, we will drive our guests to review their experiences, allowing our guests to participate directly in the process. Please review, even if your visit was ten years back. Alexandra Tour, the microcosm of South Africa, a must visit. Departing Melville with Taste of Africa, half-day visit, R 500 per person sharing. 4 hour visit, R 350 per person sharing, excluding the local transport, payable by the visitor. When we experienced the walk through Alexandra from 05:30 to 08:30, (winter 06:30 to 09:30), we experienced the Alex that we found the most attractive. Could it just be that it is cool, even the winter months can be hot during the day, or just that the magic of Alex waking up and rising around you is magic, you decide. In the interests of Radical Economic Transformation in the tourism industry, these tours are intended to cater for the Sandton visitor, where our guides can host your access, through the local taxi transport in and out of Alexandra Township. Any Half-Day Trip ex-Melville will only take place for the 05:30, 08:30 and 13:30 time slot. If departing Sandton, our guide will meet you at your hotel, if central in Sandton, or, at the Gautrain Station at 05:30, hosting you while using the local taxi from Sandton, our preferred option. Should you wish to self-drive into Alex, we will provide directions to our guide controller on 2nd Avenue Alexandra, where you can safely park your vehicle. Your guide will walk the area indicated in the map below compliments of Google. Alexandra Township the area we cover. From 1st Avenue, the taxi link and business area, we move through the small market places, moving through the Zulu enclave, and high density shack accommodation, where one of our guides lived, chased out by his neighbours in March 1991. Taste of Africa visits the Madala Men’s Hostel, the heart of the 1991 conflict in Alexandra, considered a no-go area by most people. Should the visitor wish to get deeper down into Alexandra, a trip in one of the small ‘cockroach’ taxi, will allow us to move deeper into Alexandra, and experience the cockroach. Join us for an experience you will never forget. If we wish to extend the morning visit, and stay for lunch, once again, Cedric’s favourite lunch venue is the Alexandra Men’s Hostel, please discuss this option with Cedric. Alexandra lunch another one of Cedric’s favourite venues. Alexandra, originally established as a white Township in the 1890’s then, when unable to sell land, the developer converted the Township to a black Township in 1912, sold all the land as the 1913 Land Act approached. During the 1950s Alexandra was famous for the 2 American type gangs that controlled the area. In the late 1950s and early 1960s, Alexandra, like Sophiatown, Kliptown and other areas in South Africa, was ripped apart by the expropriation of all residential land, and the forceful removal of residents to Diepkloof in Soweto, and other areas. It was the Apartheid Government’s intention to use the land for Hostel Type dwellings, to provide accommodation for the labour force, and by 1963 the male and female hostels were built. In contrast to the forced removals in Sophiatown, because Alex was due to remain a black area, the Council started to collect rentals on all accommodation that was not vacated. This resulted in difficulty to remove the land-owners who preferred to stay, and great conflict existed through till the 1970s when Rev Buti was able to change the Council’s minds and the development of Alex was again started. During the early 1980s, through some link by a financial institutions, contractors, and Councillors, property was re-sold to those who could afford bond homes. You paid a deposit, and an appointed contractor built the homes through a link to the building society. Then, in 1984 conflict in the Townships, the 1986 the rent and services boycott, aimed at all the accommodation owned by the Council impacted on those Land-owners who maintained the control over their properties. To-date, no rent is being paid, and conflict exists in many ‘land-owner groups’ who claim ownership, in the face of Government Ownership. 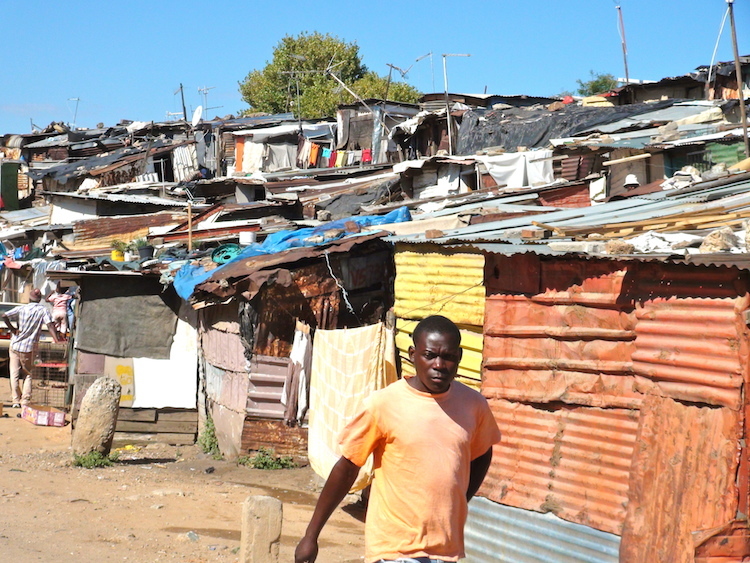 This was followed by the removal of the restrictions on ‘influx-control’ and Alex was one of the first areas where informal shack accommodation swelled, resulting in the over-populated conditions we find today, high-density accommodation that the sewerage system can’t handle. During 1990, when black on black violence, allegedly driven by outside forces, spread throughout the country, Alex, the ‘Dark City’ maintained relative peace. Then in March 1991 the IFP / ANC violence erupted in the area around the Mens Hostel. Many died, and all non-Zulus were chased out of the area, many of them leaving all their belongings and fleeing. This section today is still occupied by the Zulu contingent that occupied this enclave. This is a brief introduction to the dynamics that we need to be aware of, and dynamics that should attract South African’s to visit the microcosm of South Africa’s scattered problems. While you are looking at Alexandra, maybe Soweto is your other option? May 15, 1889 – September 23, 1970. In this narrative, I use artistic license, to allow you to receive the message directly from the Father of Soweto. “When I came to Orlando, there were three types of houses. The two-room semi-detached houses, they were the cheapest, 9/6d, the two-room house, 1/5/6d, and the three-roomed house, 1/10/6d. I could only afford the cheapest one, two-room semi at 9/6d, but it did have a large property, house 957 Orlando East. The patrons fall silent in around you in shebeen, no more talking. They all sense what is about to take place. Mpanza moves his crate away from the patrons, no longer wishing to share the details with them. He now starts to talk away from the visitors, in a very quite voice. Is he getting to the end of the story? Sofasonke goes to the toilet, leaving us all in silence. I notice him buying a nip of bandy in the far corner, he has a few sips from the bottle, and returns after ten minutes. He breaks into a broad smile, the drama around his arrest and sentence forgotten, he takes us back to his days in Soweto. 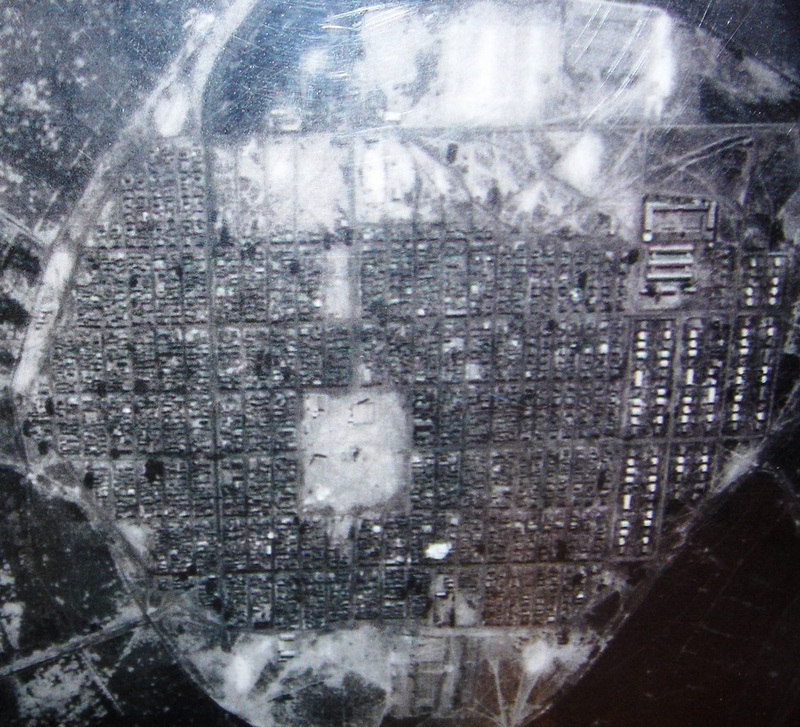 “During 1932 to 1934, three thousand five hundred houses were built in Orlando East . Mpanza indicates that they should quieten down so that he may continue, it only took one slight wave of the hand and order was restored. “The Sofasonke Party concentrated on addressing the civic interests of its members, and community. Housing, service delivery, employment, schooling, sport, crime”. Sofasonke proudly goes through the motions of getting off his horse, walking up to the door, fitting the key, turning the key, opening the door and standing back to allow the family to enter. “This advise that I gave all my followers, is the reason why I remained in house 957 Phiela Street, Orlando East, even after many moved to the new Orlando West in 1946. “In 1943, the Sofasonke party had decided it was time to act, and that we should attach municipal land, and build our shacks. In the September of 1943 we started to build hessian shacks on the community hall property, we still waited patiently for another six months, and eventually, on the 20th March 1944, we moved. “I eventually succeeded in overturning my deportation order a year later in 1946, at a cost of one thousand four hundred pounds. The day before I received the news, I had already been forced on a train, headed for Ixopo, Natal. The news of our victory, spread throughout the township and shack areas, and on my way home the next day, I was met by the entire community, celebrating for me. My wife Julia wept for joy, four animals were slaughtered, and the women cooked all day. There were celebrations, feasting, drinking and dancing, in the Streets of Orlando; such celebration will not be seen for many years to come. The Sofasonke followers in the shebeen stand and start dancing, while they sing Sofasonke Party songs. Before long the entire shebeen has joined in. Sofasonke sits down and a small wave brings order to the shebeen again. Mpanza takes another toilet and brandy nip break, and then, collects a crate and moves into the far corner, away from all the shebeen patrons, talking with less authority, almost quiet, causing the patrons to move closer. “I had overcome my conscience, I did not feel guilty, I suppressed my guilt, under the belief that I was legally not guilty. My defence was that they only had circumstantial evidence, I had not been seen at the crime scene,” Mpanza opens the scene, and the gathering feels the impact, of listening to a person, talking from the death-cell. Mpanza walks as if trapped in a small cell, deep in thought, his eyes show fear, anger. “When I was given the news of my reprieve, I went mad, shouting that I wished to be hung, right then and there.” Mpanza, jumps around the shebeen, shouting, shaking, crazy. “For the first time in my life I was afraid, afraid of the torture, the torture through eternal imprisonment. I never believed that I would be locked up. I was afraid. I wished to escape from this permanent hole. I wished to escape, through death.” Mpanza’s voice is raised, the shebeen audience feel with Mpanza, in his death cell, his now permanent cell. Mpanza sits down on another seat, the gathering is quiet, Mpanza is on his own, once again in ‘solitary confinement’. Mpanza moves to the edge of the stage, and lies down on what resembles a prison blanket, turns to face the audience, and quietly continues, in the husk voice, of an ill man, a man with a sore throat. Mpanza stares and points towards the wall / side entrance to the stage. He remains quite for awhile, staring, and the audience start focussing on where he is pointing. Suddenly a person dressed like a priest, ghostly white chalked face appears. Mpanza now stands proud; he is now the preacher that he had become in a very short period. One by one the cell mates on the stage; take turns to chant quietly in pray, as Mpanza relates his experiences. An big elderly man enters from the side dressed in a boiler suit. Mpanza turns towards the tearful man that has joined him on the stage. The elderly Sam, tears flowing, held out a hand, visibly shaking, to Mpanza, they held hands for long silent moments, staring into each others eyes. “Are you James Mpanza?” asks Sam. Mpanza continued staring into Sam’s eyes, transfixed, by this strange man that he had never met before. He tried to answer, but no words would come out of his mouth. After long silent moments, he manages a slight nod of his head, in answer. Mpanza is afraid, he continues to hold Sam’s hand, turns his face away from him, and looks up towards the sky in panic; the sky is clear, blue, and peaceful. Mpanza looks back into Sam’s eyes, and then they both kneel down, to pray together. A long minute passes, while both Mpanza and Sam pray to God, praising God and thanking God. After an hour’s prayer, Mpanza says Amen loudly; and starts to rise; still holding Sam’s hand. Mpanza feels that Sam is not responding to him rising and looks back at Sam. Sam turns his face towards Mpanza, gazes into his eyes, then; he looks up into the sky, smiles, and slowly, quietly, collapses, and dies, falling slowly into a pile, at Mpanza’s feet. Mpanza is quite, there is not a sound in the back-yard, as the audience and the players, come to terms with Mpanza’s experience. Mpanza sits down; all the jail participants sit silently, with bowed heads, to afraid to interrupt the quietness. The dear mother stares ahead, not looking at anything, I watch her, not too sure just how she is receiving this message that Mpanza had received. Having completed his presentation with these words, Mpanza is heard leaving the shebeen, the clip clop of the horses hooves, slowly disappearing. Soweto self-guided visit a Passport to Soweto, is part of Cedric & Nettie’s commitment to Radical Economic Transformation that they have been involved with since 2004. This guide-book, allows the local and international visitor to safely visit Soweto, Orlando East and Orlando West, lunch at the Nancefield Hostel for the slightly more adventurist, for between R 120 and R 240 per person, for the full day. The guide-book prepares you with local knowledge that you would require, allowing you to make the decisions on how you will spend the day, and the freedom, to move through the day, at your leisure. The Passport to Soweto, is your opportunity to economically empower, the previously disadvantaged community, leaving a green footprint behind. Visitors who have purchased the Passport to Soweto, by quoting your reference number in an email to safari@tasteofafrica.co.za, will receive advice and assistance from Cedric as you plan your day. 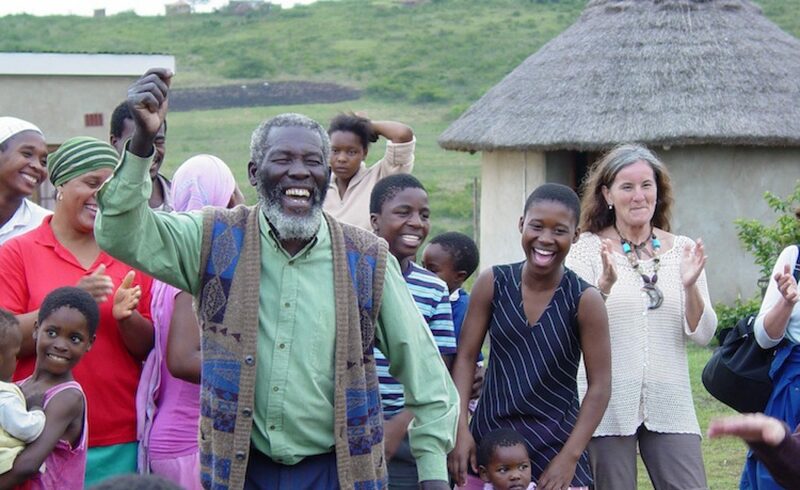 Visit Soweto with Cedric de la Harpe. Cedric & Nettie, and Passport to Soweto heritage site participant partners. Soweto tour rather visit on Spring Day, a special event if you are going to be visiting Soweto on September 1, this is the first of special experience visits that Taste of Africa offered through the Passport to Soweto Responsible Tourism initiative. Passport to Soweto, a guide that gives direction to using the Integrated Public Transport system, the Gautrain and Rea Vaya bus, and gives guidance and direction, including all the Heritage Value sites, bringing you the magic of Africa, while, everything you pay, goes directly to the community. Your day will be filled with visits to Heritage Value Sites, details of the various sites are slowly filling the Passport to Soweto blog, allowing you the option to watch the blog grow, and ask any questions. On Spring Day, Nettie and Cedric will be enjoying the day with the visitor. For international visitors, you may either buy your Passport to Soweto through Createspace; or alternatively, Buy from our Store; in which case we will despatch a .pdf version to you, and your Passport to Soweto will be delivered to your Johannesburg accommodation, or await you in Soweto. We guarantee that this will be the highlight of your visit to South Africa. Soweto tour from Sandton R 300 per person sharing, departing Gautrain Sandton. Yes it is possible to do day trips to Soweto, from Sandton, for just R 300, from Melville, for just R 240. With a “Passport to Soweto” to guide you, Johannesburg and Soweto’s new safe integrated transport system makes this budget price day trip possible. 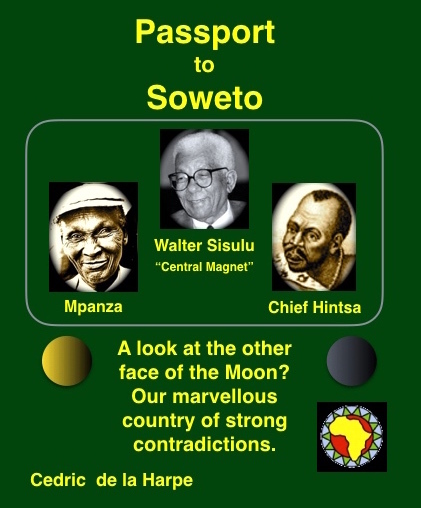 Read the free pdf of Passport to Soweto link, buy your copy, and it will be waiting for you in Soweto. Your cost of Gautrain Travel from Sandton to Park Station is approx R 30, your cost of travel from Park Station to Soweto, using the Rea Vaya, is approx R 15. From Sandton, return R 90, from Melville, return R 30. See the Gautrain and Rea Vaya links for your introduction to cheap integrated travel in Johannesburg and Soweto. The Gautrain is system is safe, you can buy a one way ticket, Sandton to Park Station, approx R 30, or, consider buying a Gold Card, and load money on the Card, allowing you to use the Gautrain Bus system, to access sites in Johannesburg. When arriving from Sandton, as you leave the Turnstile, turn sharp right, and move towards the escalator and stairs, at the top of the escalator, before the exit, turn sharp right, and right again, and leave the station at the exit, towards the Gautrain Busses, head slightly left towards the traffic lights, at the traffic light, you enter the Rea Vaya bus station. Rea Vaya allows the commuter to buy a one-way ticket, approx R 15, from the Rea Vaya bus stations, for those who wish to board a bus, off the ‘truck routes’, you would need to buy a Smart Card to travel (R25), these cards are often only bought at the Rissik Street / Park Station bus station. If arriving from the Gautrain link, you may consider buying the card, loading one cash onto it, which will allow you to use the card for extra trips, on the sub-routes that operate in Soweto. Board the T3 bus, travelling from the South to North, from the CBD, travelling from left to right, towards the entry to the Rea Vaya station, this route passes through the Melville area, if boarding in Park Station. You are heading for the SAPS Rea Vaya bus station. Taste of Africa, dedicated to open the hidden history of Soweto in the interest of the local community, will assist you to achieve this Real Price. Guides will be made available if required, please enquire. In order to spend a number of days in Johannesburg, the visitor needs to be introduced to the Johannesburg Cheap Transport Local Taxi, and to attract the international visitor to this site, already popular with our local people, Taste of Africa introduces cheap, quick, easy access, to visiting the Apartheid Museum, see below. As they were raised in Melville, both Nettie and Cedric de la Harpe will not be blamed for promoting Melville as the ideal base for your Johannesburg sojourn. To assist the budget traveller, and those who would prefer to spend their available money, on more than just transport, we will run this blog to create a culture of using the cheap transport systems, allowing you to invest in our magic. What is our motivation for this initiative, where we lose a little on transfer costs, we will make up on providing the visitor with the magic experience of walking the streets of Johannesburg, Soweto and Alexandra. For the visitor who wishes to visit the Apartheid Museum via local taxi transport, you may use the Bree Street taxi rank, see below. Mid-way between West & Sauer Streets is and entrance with a stairway to the upper floor, use the steps to the upper floor, turn right at the top, follow to the end and turn left, and then mid-way on the left is an entrance to the upper-floor. The Bree Street Rank reflects the vast changes of South African life. The ranks, when I was younger, 30 to 40 years ago, were the public parking garages, used mainly by the whites. Then, as the whites moved out of the Central Business District, and the parking garages stood empty for years, the taxi industry were housed in these buildings. 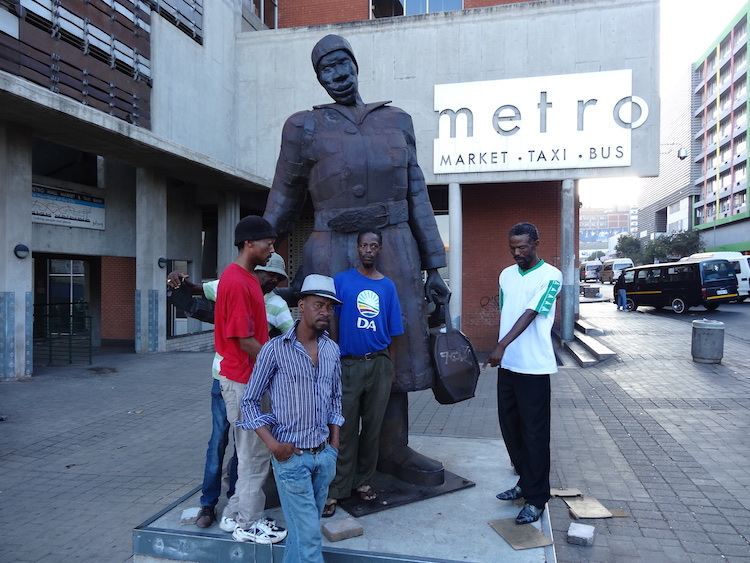 The City of Johannesburg, as part of their beautifying the city project, has commissioned numerous interesting pieces of art that surround these ranks. Both on the ground floor, and the upper-level, there are hawkers and small businesses providing for the commuters daily needs. Almost every commuter requires to use two, maybe three taxi rides to get to work in the morning. 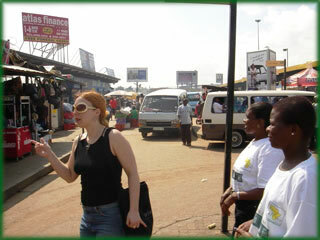 and often, the closest that the commuters get to shopping, is while they are changing from one taxi route to another. When visiting Melville, or returning to Melville, to locate the Melville taxi, use the same entrance as described above, take the steps down to basement, turn left, keep left and take the next step to the lower level, and then turn right, crossing over to the first paved isle, which service at the terminal, ask for the Melville taxi. When leaving Melville, use Main Road, south, or Kingsway, east, index finger in the air, will stop the taxi. 3 fingers indicates Bree Street, 5 fingers indicates Noord Street. Just after you pass the Gas Works, on the corner of Enoch Sontongo Street,the taxi may stop, this is if the driver is aware that a passenger wishes to divert past the Oriental Plaza, Newtown to Bree rank. At this stage, passengers are redistributed as the same association shares the passengers among the two routes. This is your opportunity to visit the Oriental Plaza en route to Newtown. For those of you who would prefer a guide to experience the magic of these areas, Taste of Africa will oblige, we are just not into, selling the typical tourist site, that only requires transfer. This section is aimed at permitting the more adventurous visitor to get through Johannesburg, and into Soweto while they appreciate the magic that exists, as economically as possible. For those who have climbed Kilimanjaro, I always say, reaching the Peak was great, but I will always remember the getting there. Use this section in combination with the traditional Street Maps and guide books. Taste of Africa will assist with any enquiries via contact below, or info@tasteofafrica.co.za, provided you make enquiries seven days ahead of your visit. For those visitors who make use of a Taste of Africa guiding services through Johannesburg & Soweto, we will support you throughout your stay in Johannesburg, should you wish to venture through Johannesburg on your own. ‘Local shared taxi’ a negative in the suburban South African communities, but the daily mode of transport for 65% of the South African community. You are able to board a local taxi on most corners in the Urban areas, however, at peak times it is often essential to stand in the queue at the taxi rank, as the taxi will be fill when they pass. We must warn you, many of the boarding stations very little respect for age and gender is given, if the taxi door opens, get in first, else you will be left on the street. In general, the index finger pointed towards the sky will stop a taxi heading for the centre of the city, however, many ranks also have their individual signs when a route provides the service to more than one rank. When in the taxi rank, ask the drivers/controllers to ensure that you are boarding the correct taxi, tell the driver and passengers where you wish to alight, if you are boarding on a street corner, ask other on the corner for the desired hand-sign for your destination. When boarding a taxi always have your fare ready, do not use large notes early in the morning. The fares are passed from the rear of the taxi to the passenger sitting alongside the driver, or alternatively to the driver. Where possible you are expected to collect fares and take change during the process to relieve the driver of the load. Just a word of warning, ask, there are areas where payments take place at certain points en route, and sometimes, just before you alight. Always ensure that the driver knows where you wish to be dropped, and do not hesitate to talk to your fellow passengers if you are not sure. Our support information will prepare you for what you can expect when you arrive at the terminal, in order that you do not give the appearance of being lost on arrival. Throughout the world you need to be aware, do not be careless with your camera, do not flash your wallet around, and decline an offer of any ‘tout’ who wishes to show you around. Read up before you venture into the area, know what you are visiting and the times that they are open. In these high-density pedestrian traffic areas that you will go through at the taxi terminals, the community are very aware of your level of anxiety. The more relaxed you are, the more you are respected. The Bree Street rank services the Soweto, Melville to Rosebank / Randburg areas, and through to Hillbrow. From Melville you will cross the Nelson Mandela Bridge. Then alight as the taxi take the left just before the rank. When using the taxi to Bree, and you wish to get to Noord, please ask the driver, they could be including the Noord in their link. The Newtown area, off the Museum Africa area, is a short walk. 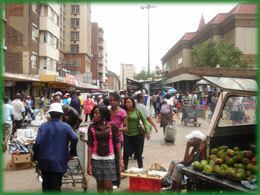 A look at the Johannesburg Central Business District, (Downtown). A visit to Newtown wouldn’t be complete without taking in some of the restaurants and nightlife spots which lend themselves to the eclectic, multicultural, artistic reputation of the area. Open: Monday 12h00 to 00h00, Tuesday 12h00 to 22h00, Wednesday to Sat 12h00 to 00h00, closed on Sunday. Constitution Hill, can be accessed from the Bree Street taxi rank, either using the taxi that goes to Yeoville, or a walk via Mandela Bridge and Braamfontein. Coming in from Sandton, towards the Noord Street rank, the driver can drop you a block away, coming from Melville, you can alight, as you approach the Mandela Bridge, and walk up through Braamfontien, moving around the Civic centre. The Noord Street Taxi Rank, consists on the enclosed MTN Rank, as seen below, but also covers the extended are as discussed below. Noord Street is easily accessed when arriving by taxi from the Northern and Eastern suburbs and Alexandra. It is recognised by the high density taxi traffic and the high density pedestrian traffic. Taxis travelling from the Melville Area, do have the option of taking you through to Noord Street, check with the driver, if not, there is a ‘local feed’ operating between Bree and Noord. 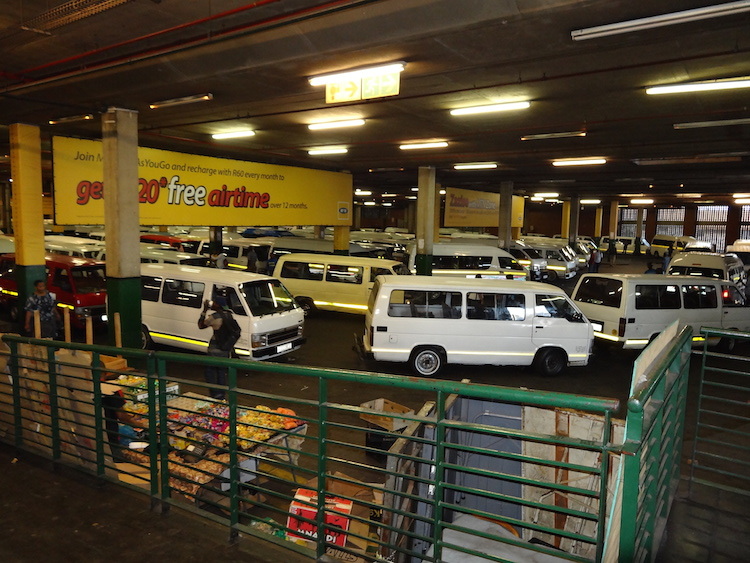 Taxis are restricted to leave from certain ranks, but when the arrive in central Johannesburg, there is very little restriction. 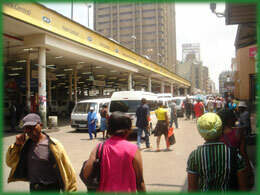 Johannesburg Cheap Transport Local Taxi Noord Street Taxi Rank Node. Noord Street area, Johannesburg Cheap Transport Local Taxi. 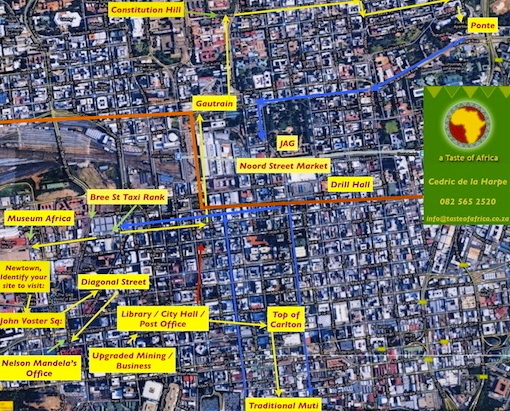 From the North and East, many taxi’s arrive in the Noord Street area on Klein Street, travelling from North to South. From this rank you will access taxi’s to Pretoria, Sandton, Alexandra, and suburbs to the East. On your left is Joubert Park, then the Johannesburg Art Gallery, your taxi will pass the JAG on the left, cross the rail line, and first a shopping centre on your left. You will need to alight between Noord Street and De Villiers Street. The Rank now is enclosed, as per picture above, the view is shown from Twist Street, and the shopping centre is on your right. If wishing to move to the Bree Street Taxi Rank, move to the far side of the MTN Taxi Tank to Plain Street, diagonally opposite on the left, Corner Klein and Plein Street, under the big sign, Taxi Butchery, you board the taxi to Bree. The Drill Hall can be visited while in the area, walk through between the MTN Taxi Rank and the shopping centre, and cross Twist Street, the large red building seen opposite. This is the more difficult option, mainly because you must not ask for assistance, there is no person on the airport who will believe that you can use a local taxi, after-all, you have enough money to used an expensive taxi. Leave the arrivals terminal, onto the road way, turn right, and walk towards the oncoming vehicles that are arriving. As you leave the arrivals terminal, keep right, you will reach a fork that takes you down to a road way, at a lower level. Parked just under the vehicle ramp, you will find a shared taxi, if not, ask a local, the taxi will arrive soon. During the morning, and late afternoon, your taxi will take you straight to the De Villiers Street rank, two blocks from the MTN rank, should they not be travelling direct, they will move via the Kempton Park taxi rank, where you may need to switch taxi. A few years back, using this link, we could access Soweto, via the MTN rank for a total of R 45, today it my be R 60. Johannesburg’s link to Long Distance Taxi’s depart from the seen on the Google Map, just north of Noord Street, on Wanderers Street. You must get there early in the morning if you wish to use this service. I would suggest that you visit the area the day before you wish to depart, but it is not necessary. Google View, Taxi Rank on left, Bridge Shopping Centre on the right. Situated on Faraday off Eloff Street, neighbour to the Faraday Traditional Medicine Market, well worth a visit. Please feel free to call me, Cedric 082 565 2520. On the 15th May 2005, we present a backyard theatre where James Mpanza relates early Soweto History educating both Taste of Africa Soweto Tour visitors, my family and friends, Sofasonke’s family and the community. SunValley; Unfortunately Google Maps can’t give us more than this. 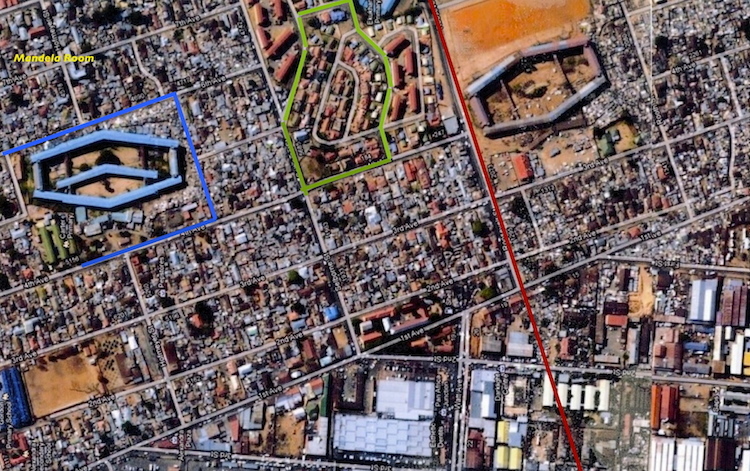 The Blue Building on the right is Musi High School, and to the left, the grey roof, now a shopping centre, was where the , ‘ematangeni’ concentration camp was originally located. The Rail siding can be seen on the ariel photo. The hillock can be seen on the ariel photo. I use part of a backyard theatre production, presented on the 15th May 2005, both Sofasonke and my birthday, to give a little history into SunValley for my family, friends and Sowetans.